2009 1125R in White: Fun any way you slice it. We rode the 2009 Buell 1125R and 1125CR models at the Buell Inside Pass Track Day at Infineon Raceway. Though our main focus was on the track riding sessions (and the track itself), we learned enough about the bikes to offer a street rider's perspective on their performance during moderately aggressive riding. (If you are interested in reading about the track day session, see our Buell Inside Pass track day article). The 1125R (introduced in 2008) and the new-for-2009 1125CR represent a radical departure for Buell–no matter how much they evolved the Sportster-derived motors, Buell would always encounter resistance to the 'paint shaker' image of the legacy motor design: though torquey and tractable, many sporting riders prefer modern power delivery, higher redlines, slicker-shifting gearboxes. It shouldn't surprise anyone to find that tech bits like double overhead cams, multiple valves per cylinder, stratospheric redlines, peak horsepower, close-ratio gearboxes and other spec-sheet details are the stuff of bench-racing sessions, whether or not they have a significant impact on a given rider's street or track results. Here's your clean break: the 1125R and 1125CR are equipped with identical Rotax-built Helicon 72-degree V-Twin engines. Enhancements for 2009 include remapped ignition and fuel injection and targeted injectors. These changes were intended to improve throttle response and drivability below 6000 RPM, and improve fuel economy. Buell claims 146 crankshaft horsepower and 82 ft. lbs. peak torque for both bikes. Suspension, brakes, tires and chassis are the same on both–for the 1125CR, a surprising and welcome change from the retuned (and often detuned) engines and less-capable chassis found on some sportbike-derived standards or hooligan bikes. Both models have a claimed dry weight of 375 pounds. Major differences: the 1125CR has 8 percent lower gearing than the 1125R, 76/27 (2.815:1) vs. 70/27 (2.593:1). The 1125CR’s clubman-style handlebars seem farther forward than the 1125R’s bars, resulting in a longer reach. 2009 Buell 1125CR - Front View: Unusual styling fades into the background once you take your first ride. The new-for-2009 black frame and other components enhance the appearance of the available paint colors. Buell designs are unconventional and the 1125CR and 1125R are no exception. Both bikes have unusual bulging lower fairing ducts that act as part of the cooling system. While not unattractive, my initial impression (especially of the 1125R) when viewed from front angles was that of an aerodynamic and slightly angry squirrel's overstuffed cheeks. The styling is striking and unusual, but once the novelty wore off the styling grew on me. 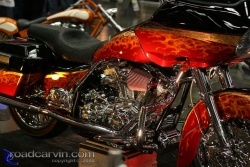 I began to see two light, nimble, exciting bikes waiting to be ridden hard under demanding conditions. We rode the Buell 1125CR and 1125R at Buell's Inside Pass track day at Infineon Raceway. Although we were kept busy by track riding classes and sessions, we now have a taste of what it's like to ride these exciting and capable motorcycles. Due to lower gearing, the Buell 1125CR was quicker-revving, so much so that I bounced off the rev limiter several times while exiting turns. This also made the CR light in the front end during hard acceleration. I suppose that riding the 1125R during slower morning sessions then switching to the 1125CR contributed this perception, as I had grown accustomed to the 1125R’s taller gearing before switching to the CR. I didn't have an opportunity to ride the 1125R during afternoon sessions, so I can't comment on the R's behavior under hard acceleration. Speaking as an inexperienced track rider, I found both bikes' track manners supremely confidence inspiring. Riding the 1125CR during faster sessions, I encountered no surprises as I made my way around the track, even as I increased my pace. Steering felt light and neutral. Braking was smooth and consistent, requiring only a light touch to reduce speeds quickly. If you want to see what the 1125R can do on the track, racer Ken Hill was riding that day on a bone-stock 1125R, showing off the bike's capabilities. You can watch the video here. Both models were equipped with Pirelli Corsa III tires. We have no doubt that these sticky performance tires enhanced our track experience. When I rode the 2008 1125R prototype at Laguna Seca, December 2008 it rained the entire day so it was hard to evaluate performance. This year, we had both 2009 Buell 1125R and 1125CR motorcycles at our disposal, and Indian summer weather made for a perfect track day, allowing us to evaluate the Buell 1125 models under near-ideal conditions. Updated fuel map and relocated injectors performed flawlessly with smooth throttle response from low rpm's to redline. The HVA (Hydraulic Vacuum Assist) Slipper action clutch really works. The release is smooth and never upsets the chassis. The brakes work very well with good feel and power. 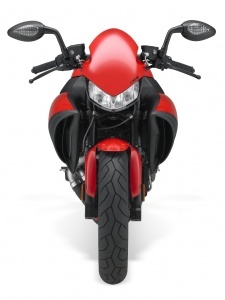 Buell motorcycles have always had top-notch suspension and brake components. The 1125R and 1125CR are designed for the rider. The comfortable ergonomics and blend of suspension, brakes and powerful Helicon engine enhance the riding experience. On the track I preferred the 1125R, as I'm used to superbike ergos, and the 1125R turn-in and grip feedback were confidence inspiring. The 1125CR is a back-road burner; the lower gearing and café racer ergos are just the ticket for your favorite back roads. Grunt from down low means riding twisty roads will not require dancing on the shifter, hunting for the right gear. It's also nice to ride a standard that has a superbike engine and not a re-tuned adaptation. The 8% lower gearing is noticeable and combined with the clubman bars gives the 1125CR a unique personality. Buell has come a long way; fit, finish and reliability have been improved. Most of the demo bikes used had over 3,000 track day miles and many of those miles were run in back to back track sessions. The Buell motorcycles performed well under tough conditions. I look forward to riding the 2009 Buell 1125s on the street. The engine's powerband seemed limitless during my later track sessions. Good power down low, lots of power on tap all the way to the rev limiter. The Helicon motor revs freely from lower RPMs all the way to redline. The V-Twin pulses smooth out above idle though you always know the motor is working beneath you–there are noticeable mechanical noises and vibrations; while on the track neither was annoying or distracting–these added to the experience, reminding me that I was riding a high-performance motorcycle rather than commuting to work on a hybrid scooter. Of course, I might be more aware of the sensations during a commute or a longer street ride rather than a series of 20-minute track blasts. Only time (and miles) will tell. The HVA (Hydraulic Vacuum Assist) slipper clutch came in handy a few times as I down-shifted the 1125CR aggressively heading into a few of the turns–compression braking threatened to lock up the rear wheel but the slipper clutch minimized traction loss, as intended. Shifting was crisp and precise. I really didn't pay much attention to the transmission whether using the clutch or during clutchless upshifts. That's a great compliment–if it's off my radar, it's working well. Every 1125R and CR I rode that day suffered from occasional hard-starting when hot. I had to restart them several times due to stalling–a few blips of the throttle were necessary in order to clear up the problem and keep them from stalling again. I don't know if this was an anomaly–I'll address this on my next opportunity to test one of these bikes off-track. I noticed the toes of my right foot feeling hot a few times, probably due to close proximity to the engine cases on that side. Nothing too unpleasant, just something I noticed. Both models are fun and capable. We were able to ride them aggressively with minimal fuss. The gearing differences make the 1125CR the quicker-revving bike (and more wheelie-prone), but the shorter gearing means you'll be working the gearshift more often. Both models exhibit great handling, braking, and a very usable power band. Unusual styling grew on me quickly. The bike is attractive from some angles and odd-looking from others, but I can say that about many, if not most, modern bikes. Ergonomics seemed right for me during the limited time on the track. Overall, both bikes are attractive. I really enjoyed the 1125CR (which I rode in all the afternoon track sessions.) It's a thrilling and confidence-inspiring ride. 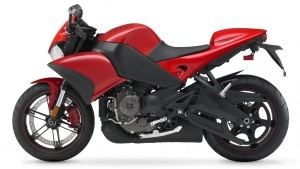 If you're in the market for a big-bore V-Twin sportbike, you should consider these Buell models. 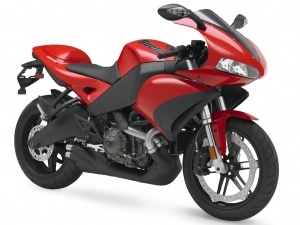 The 2009 Buell 1125CR is available with Racing Red or Midnight Black bodywork. MSRP: $11,695 USD. The 2009 1125R is offered in Midnight Black and new Racing Red with Phantom Metallic (Black) wheels, and Arctic White with Hero Blue translucent wheels. MSRP: $11,995 USD. Buell Inside Pass - The Ultimate Track Day By Buell Motorcycles. Track photography by Keith Breazeal of Keith Breazeal Video Productions. New model photos courtesy of Buell Motorcycles. Roadcarvin Magazine attended the Buell Inside Pass Track Day at Infineon November 17, 2008 as guests of Buell Motorcycles, and we were given an opportunity to ride the 2009 Buell 1125R and the new 2009 1125CR at the track. This article focuses on our impression of the 1125R and the 1125CR. You can read about the track day here.